Imagine Having Your Choice Of Wholesale Crystals Covering 100+ Categories, Countless Varieties And A Gold Coast Crystal Showroom With Thousands Upon Thousands Of Amazing Crystals To Choose From. We Are Serious About Offering The Greatest Selection Of Crystals At The Absolute Best Prices For Our Retailers. We've Been Around the World Selecting our Crystals, so be Sure to Check Out Our Photo Gallery. To help you navigate around Wholesale Crystals Australia, we have some links to point you in the right direction and give you the answers you are looking for quickly. • Can we visit your location? Welcome to WholesaleCrystalsAustralia.com where you get to enjoy the most incredible range of wholesale crystals personally sourced from some of the most incredible crystal locations around the world. At any one time we have around $3 million worth of stock sitting in our Gold Coast showroom and a team of passionate, friendly staff ready to assist with your selections. Having been involved in wholesaling crystals since 2004, we are well positioned to answer all your questions and guide you to the best possible selections for your retail outlet, market stall or online outlet, irrespective of whether you are in Sydney, Melbourne, Gold Coast, Brisbane or as far north as Cairns. 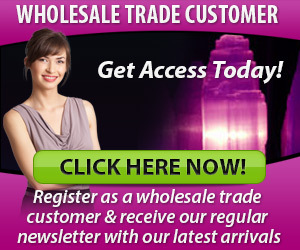 You are welcome to register as a wholesale trade customer by clicking the banner below. We always support our customers and help them maximise their business opportunities wherever possible.